Today, Rapids fosters year-round, intermediate thru elite level national athlete development. Rapids is designed for the higher skilled and dedicated player who wants to get to the next level: a high school player, a high school starter or even a national level athlete. We provide year-round playing opportunities for U10-U19 players seeking to compete at a higher level while traveling to local, regional, and national tournaments. Tryouts are held each season and separate evaluations will be held for those players seeking to attend national/recruiting tournaments. We offer dedicated goalie coaches and training, to specifically help our keepers become the best of the best. Rapids believes in holding our club members, parents & staff to the highest level of our core standards and values to develop, great teammates, leaders and athletes. We expect our athletes to display sportsmanship, commitment, humility and grace on and off the field. We seek to develop players who respect the game and love the game. Youth sports can deeply impact a child’s life and our goal is to make that impact a positive life lasting one. ​We encourage our players to have well-rounded lives. 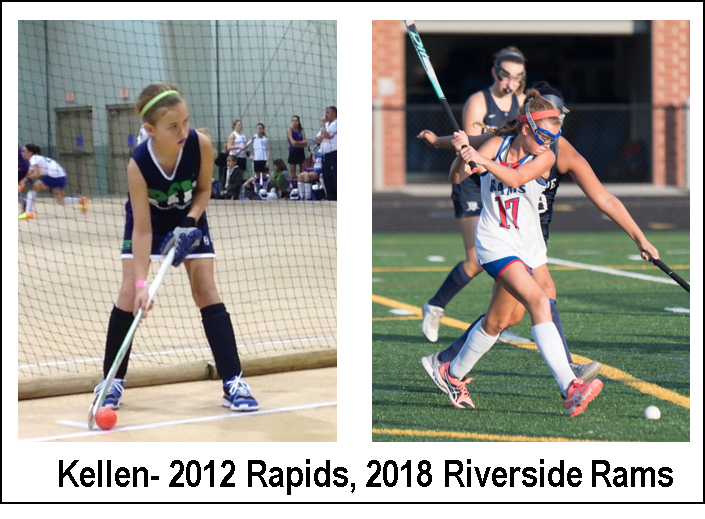 Our club members are field hockey players, but they are also: lacrosse players, soccer players, track stars, actors/actresses & musicians (see player bios). While we support our players lives outside of field hockey, we do expect a level of commitment to the team itself so no team is left shorthanded or unprepared. Absences are sometimes unavoidable due to sickness etc and should be communicated to the coach. Injuries unfortunately do occur and you should talk to your coach about their expectations. The Rapids Team of coaches are also committed to help our players be recruited to play in college and beyond. Our U16/U19 age group coach, is a current college coach and former DI player and knows what it takes to pursue college play and how to find a "right fit" for your player. We participate in various showcases and National level tournaments to give our players the best exposure to college coaches. Tryouts are held for each college showcase team, with coaches making all decisions on final rosters so as to best showcase our players. We can provide top level training and competition through confidential scholarships to those players who qualify. Please email: <insert email> for information.